Join us for an evening of entertainment and acrobatic circus acts on Friday, July 28th. Wheel Jam Circus performers w ill be giving a free performance from 5-7 pm as part of Loyola’s Summer on the Plaza. Treats from The MORE Mobile Cupcake Truck will also be available. Please join us for an evening of live jazz music by Roy McGrath on the evening of July 26th! Throughout the summer, local entertainers will get a chance to showcase their work outside the Loyola CTA Plaza as part of Loyola’s Summer on the Plaza. The MORE Mobile Cupcake Truck will also be providing treats throughout the evening. Every Monday from 3-7 pm, check out the Loyola Farmers Market. Located outside the Loyola CTA redline stop, the Loyola Farmers Market seeks to increase the access to locally grown and produced foods, thereby greatly supporting community members. All money gene rated goes directly to the market’s farmers and producers. Join us for an evening of entertainment and acrobatic circus acts on Wednesday, July 21st. Wheel Jam Circus performers will b e giving a free performance from 5-7 pm as part of Loyola’s Summer on the Plaza. As part of Loyola’s Summer on the Plaza, check out a performance by folk-rock musician Humphrey McKeown. Sweet treats from The MORE Mobile Cupcake Truck will also be available. Every Monday from 3-7 pm, check out the Loyola Farmers Market. Located outside the Loyola CTA redline stop, the Loyola Farmers Market seeks to increase the access to locally grown and produced foods, thereby greatly supporting community members. All money generated goes directly to the market’s farmers and producers. As part of Loyola’s Summer on the Plaza, check out a performance by Latin Street Music & Dance from 5-7 pm. Sw eet treats will also be provided by The MORE Mobile Cupcake Truck. As part of Loyola’s Summer on the Plaza, check out live soul music by Joyce Renee Band from 5-7 pm. Sweet treats will a lso be provided by The MORE Mobile Cupcake Truck. Every Monday from 3-7 pm, check out the Loyola Farmers Market. 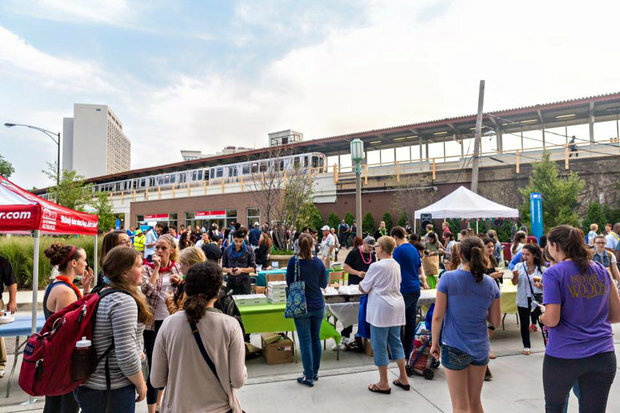 Located outside the Loyola CTA Red Line stop, the Loyola Farmers Market seeks to increase the access to locally grown and produced foods, thereby greatly supporting community members. All money gener ated goes directly to the market’s farmers and producers. As part of Loyola’s Summer on the Plaza, check out live music from 5-7 pm by acoustic duo Lunar Moo. There will also be a free art-making session with AARTWERK Studio, as well as sweet treats provided by The MORE Cupcake Mobile Truck.